Blitz tournanents was played today. Kolesov Gavril, Germogenov Nikolay and Dashkov Oleg won WMSG-64 among men. Makarenkova Juliia, Kirillina Stepanida and Sarshaeva Zhanna won WMSG-64 among women. Arrival day is Wednesday, 15th of August. Please come to FMJD office at Lille Grand Palais (Espace Jeanne de Flandre). You will pay your fees and will receive your badges and you can see playing hall. We are waiting for you from 15:00 untill 19:00. If you can not arrive on registration at this time, please inform us in advance about your participation by e-mail [email protected]. 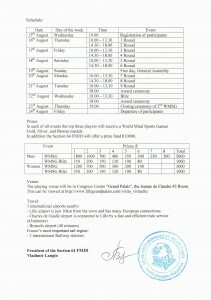 All participants need to be in playing room at 9:30, 16th of August. Not later! 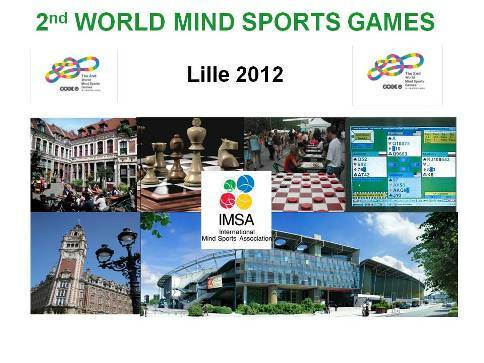 The 2nd World Mind Sports Games will take place at Lille, France, in “Grand Palais” from 9th to 23rd August 2012. Competitions among men are held by the Brazilian version of draughts-64. Competitions among women are held by the Russian version of draughts-64. 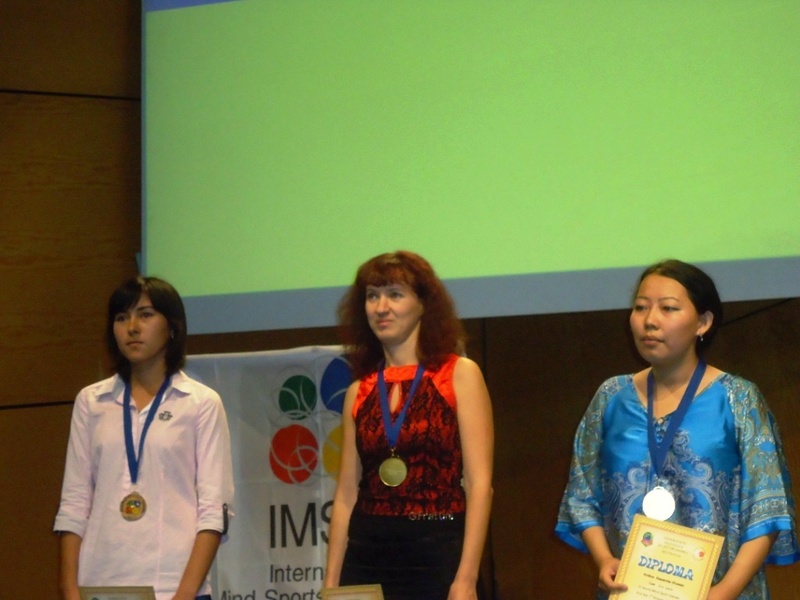 Dashkov Oleg (Russia) World champion 2011; Fedorova Natalia (Russia) World champion 2011. Other countries may to send one player in both men and women. Countries wishing to enter more players can request extra places. Additional players will be placed on the reserve list. 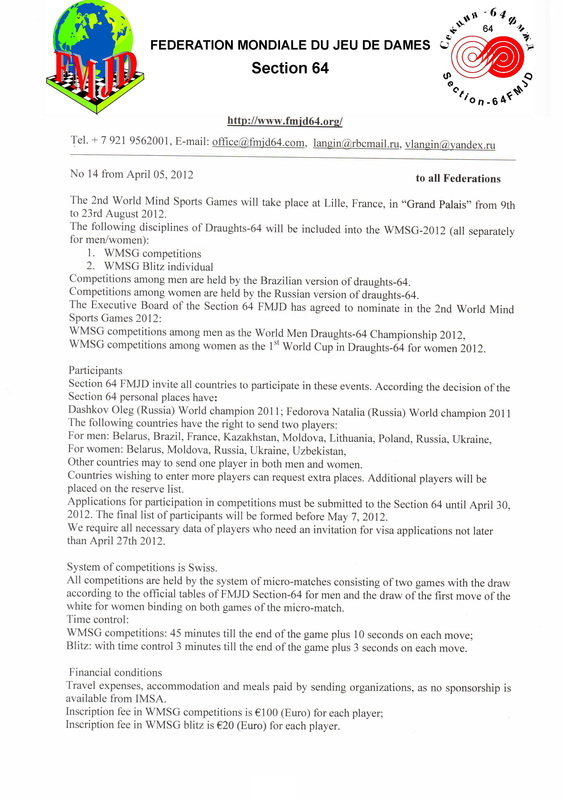 Applications for participation in competitions must be submitted to the Section 64 until April 30, 2012. 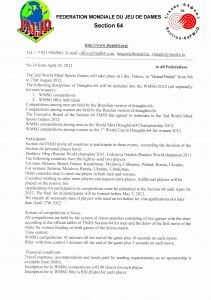 The final list of participants will be formed before May 7, 2012. We require all necessary data of players who need an invitation for visa applications not later than April 27th 2012. 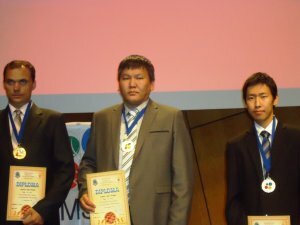 System of competitions is Swiss. 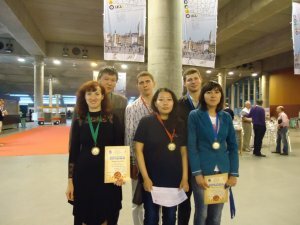 All competitions are held by the system of micro-matches consisting of two games with the draw according to the official tables of FMJD Section-64 for men and the draw of the first move of the white for women binding on both games of the micro-match. Blitz: 3 minutes till the end of the game plus 3 seconds on each move. Travel expenses, accommodation and meals paid by sending organizations, as no sponsorship is available from IMSA. Inscription fee in WMSG blitz is €20 (Euro) for each player. 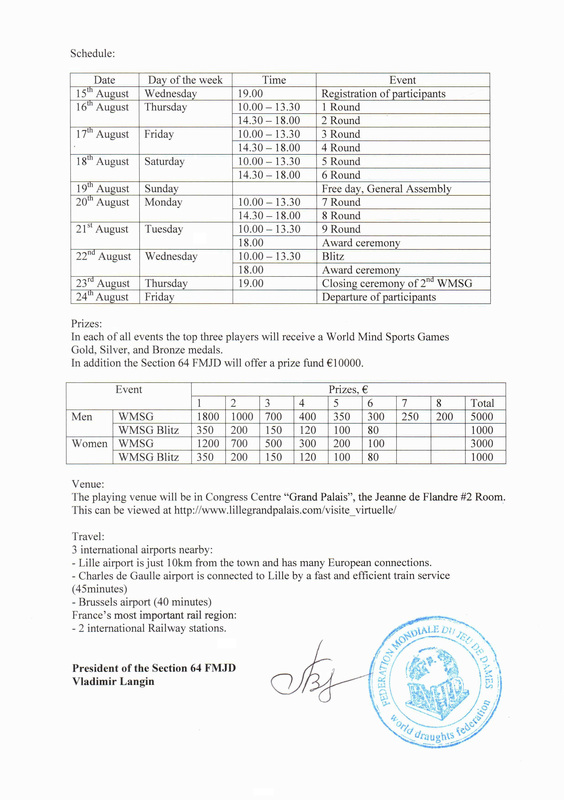 In each of all events the top three players will receive a World Mind Sports Games Gold, Silver, and Bronze medals. 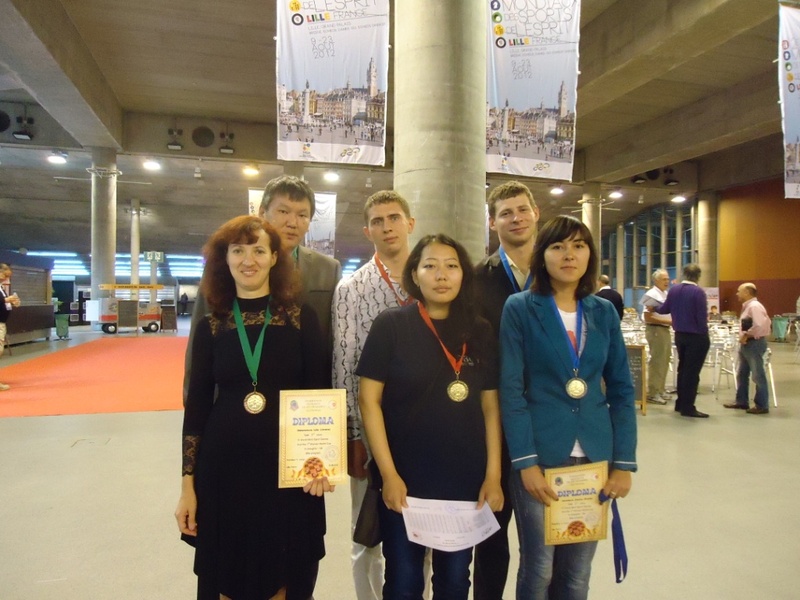 In addition the Section 64 FMJD will offer a prize fund €10000. IMSA have negotiated very good rates with some hotels , within walking distance from Lille Grand Palais the Congress Centre. See the list of recommended hotels where rates has been negociated. -Lilleairport is just 10km from the town and has many European connections. – 2 international Railway stations.